How to prepare and serve onasadya (Onam Sadya / Kerala feast) dishes. Home » Blogs » Food techniques » How to prepare and serve onasadya dishes? Onam is the state festival of Kerala which has a history as old as the history of Kerala. It is celebrated as a joyous annual reminiscence of the golden rule of a mythical King Mahabali, who ruled Kerala a very long time ago. You can read more about this story behind Onam here. Although the Onam festival has its origin in Hindu mythology, in the secular state of Kerala it is celebrated with equal fervor by people of all religion. Onam falls during the month of Chingam, the first month of the Malayalam Calendar, usually in August–September. The celebrations begin within a fortnight of the month Chingam and go on for ten days. The last day called the “Thiruvonam” is the most important. Onapookalam (multi-coloured floral decoration on the ground in the front of their home). Onakkodi (the new clothes worn on the day of thiruvonam). Vallamkali (the snake boat race). Onasadya (the grand Kerala feast) which is quite elaborate. Its a strictly vegetarian meal with Rice as the main ingredient. The sadya is served on banana leaves and serves rice along with minimum 4 dishes excluding traditional pickles and papadam followed by at-least one dessert. 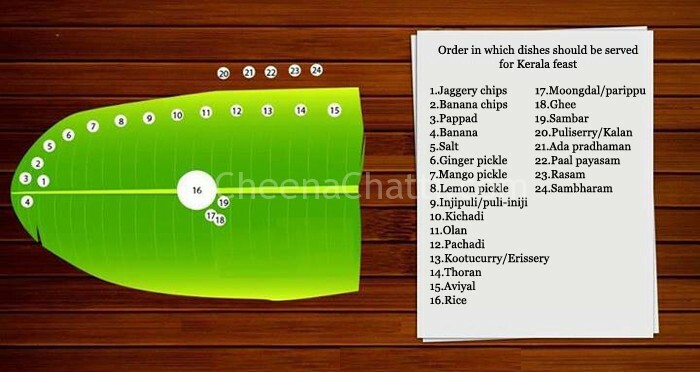 The side dishes (usually 11, but can go even beyond 20) are Kalan or Pulisseri, Erissery, Olan, Pachadi, Kichadi, Thoran, Mulakoshyam, Koottukari, Aviyal, Sambar, Rasam, Upperi or chips, Pickles (achaar), Pappads (pappadam). This colorful arrangement of the food on the lush green banana leaves makes it even more tempting and irresistible. The desserts are Payasams & Prathamans. Sorry, as CheenaChatti webpage is in its initial days, the recipes for some of the dishes are not available. How to serve sadya dishes? The meal is traditionally served on a mat laid on the floor. The dishes has to be served on a tender banana leaf, laid with the end to the left side of the guest. The main ingredient Rice is served only when the guests seat themselves. Only just two big spoons of rice is served initially. After this “parippu” and ghee is poured. Then comes Sambhar, Kalan (pulissery) and Rasam. The second round goes with 1 big spoon of rice and the desserts like adaprathaman ,Kadala Payasam, paal payasam etc. The third and final round of rice is served with Sambharam / Butter milk. That finishes serving the dishes. The guests are supposed to fold the leaves after finishing their lunch. This entry was written on August 24th, 2013 by Jameela Beevi. Posted in Food techniques and was last revised on January 3rd, 2016. The order is wrong for some items. Please correct it. @Lakshmi : it will be great if you let me know the wrongly placed ones and the correct position of those dishes. Others are in right order. Thank you . it is really help full to me.